This majestic original painting was created by Robert Stephen Simon in 1985 and features legendary ballplayer Mickey Mantle who is regarded as one of the greatest switch hitters of all-time. 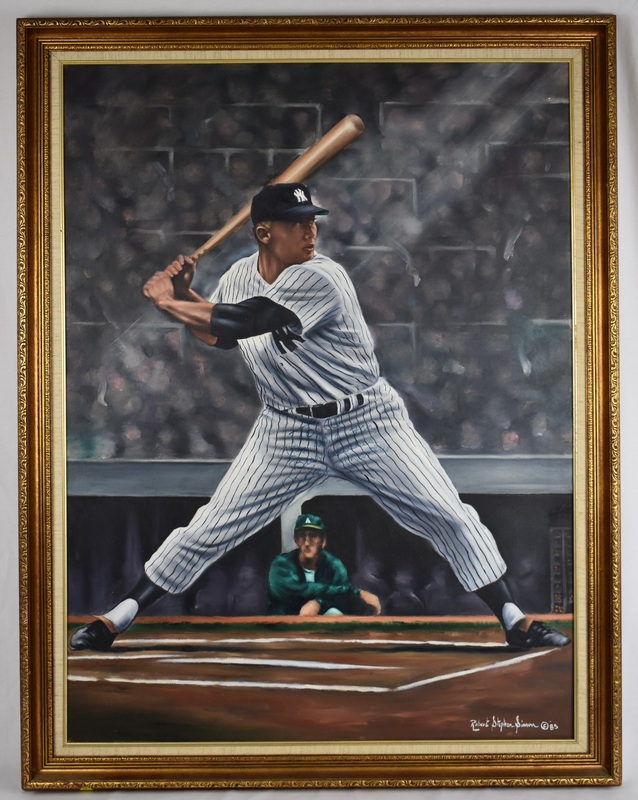 His accomplishments include 20 All-Star Games, 4x Home Run Champion, 7x World Series Champion, 3x AL MVP and in 1956 he won the Triple Crown. His #7 is hung proudly at Yankee Stadium after playing his entire career for them. 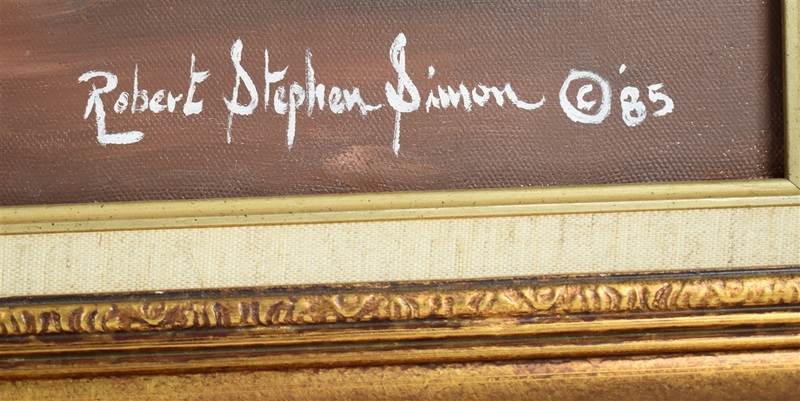 This stunning original oil painting measures 36x45 and has been attractively framed and dated by Simon himself. Mr. Simon's work has won many prestigious awards and has captured the imagination of collectors all over the world, including the White House. The Eagle Club of Washington, D.C., The International Society of Artists, The Baseball Hall of Fame, and many private collectors including The White House collections of former President George Bush and President Barrack Obama. Simon was artistically diverse, had a wide array of interest and has always been very popular among sports collectors and enthusiasts. Simon counted many famous people among his friends, from George Steinbrenner and Mickey Mantle to Duke basketball coach Mike Krzyzewski. Mr. Simon passed away back in 2014 and his work remains revered by many and his originals command premiums. 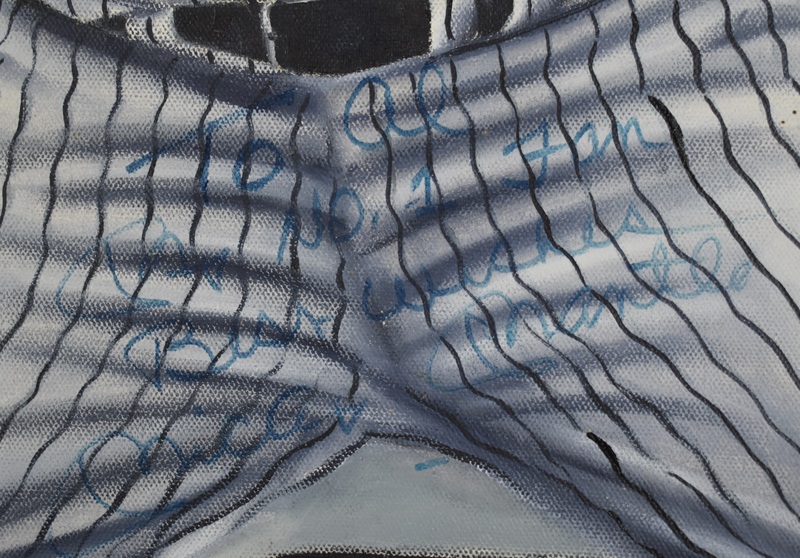 Truly a unique and historic work of art that has been signed and inscribed by Mickey Mantle himself: "To Al, My No. 1 Fan, Best Wishes Mickey Mantle" in blue marker.